It was this song and the movements with it led by Ben Guess at our closing luncheon at Widening the Welcome II: Inclusion for All that came to me as I began to reflect on the Conference, Sept. 29-Oct. 1, 2011 in Columbus, OH. Over 100 of us gathered from Maine and Massachusetts to Seattle and San Diego and from Georgia and Texas to South Dakota and Minnesota and states between. The purpose of the event was to help churches become more welcoming of those living with mental illness. What did we want to accomplish? To break down the barriers in our language about inclusion/disabilities/mental illnesses, to see ways to overcome the inaccessibility of our buildings, to enrich our theology of disabilities, to confront our attitudes about brain disorders/mental illness, to find ways to move our congregations to become A2A (Accessible to All) and to encourage the development of Mental Health Ministries in our congregations. The conference keynote speakers were J. Bennett Guess, Executive Minister for Local Church Ministries of the UCC; Christine Guth, Program Director for Anabaptist Disabilities Network; Thomas Reynolds, Associate Professor of Theology at Emmanuel College, Toronto; and Carolyn Thompson, retired from the Commission for Persons with Disabilities in Cambridge, MA. Along with that we worshiped, spent connecting time in small groups, called CORE groups to get to know others and learn from each other. The 18 workshops provided a wide variety of information and DVD’s and CD’s are available for purchase from Florian Audio Visual. There were suggestions of ways to improve the conference, too, and we will take all of those to heart. We continue to discern where God is leading us in this movement in the movement of the UCC. Please stay in touch with us and even send us your prayerful and thoughtful suggestions. To keep up with the currents of this deepening and widening movement, please subscribe to the Widening the Welcome email list. 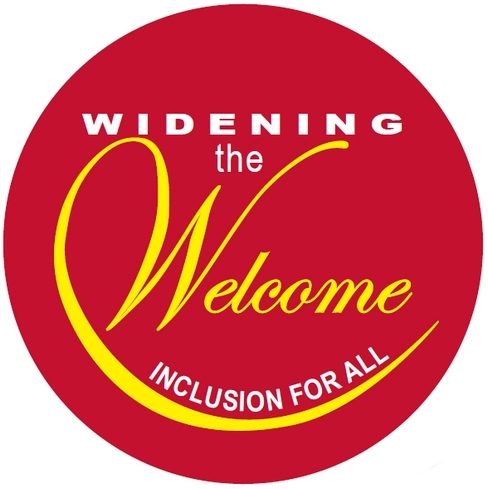 You can find a link to sign up at the bottom of the resource page or send an email to list@wideningthewelcome.com. You can also keep up on the Widening the Welcome Facebook page. You can also ask any questions in an email to Alan Johnson at revalan2004@comcast.net. One final note. The registration for this year's conference was $115. That included two dinners, two lunches, the entire program of keynote speakers and workshop leaders, engaging worship and music, organizational skills and the Journal. The reason that the cost was so low was because the UCC Local Church Ministries (LCM) provided substantial financial support through the UCC Disabilities and the UCC Mental Illness Network. All of us thanked the UCC LCM for their presence and their support. May our churches continue to be even more Deep and Wide!